Conductors lose all of their electrical resistance when cooled to super-low temperatures (near absolute zero, about -273o Celsius). It must be understood that superconductivity is not merely an extrapolation of most conductors' tendency to gradually lose resistance with decreasing temperature; rather, it is a sudden, quantum leap in resistivity from finite to nothing. A superconducting material has absolutely zero electrical resistance, not just some small amount. Superconductivity was first discovered by H. Kamerlingh Onnes at the University of Leiden, Netherlands in 1911. Just three years earlier, in 1908, Onnes had developed a method of liquefying helium gas, which provided a medium with which to supercool experimental objects to just a few degrees above absolute zero. Deciding to investigate changes in electrical resistance of mercury when cooled to this low of a temperature, he discovered that its resistance dropped to nothing just below the boiling point of helium. The threshold temperature for a superconductor to switch from normal conduction to superconductivity is called the transition temperature. Transition temperatures for "classic" superconductors are in the cryogenic range (near absolute zero), but much progress has been made in developing "high-temperature" superconductors which superconduct at warmer temperatures. One type is a ceramic mixture of yttrium, barium, copper, and oxygen which transitions at a relatively balmy -160o Celsius. Ideally, a superconductor should be able to operate within the range of ambient temperatures, or at least within the range of inexpensive refrigeration equipment. The critical temperatures for a few common substances are shown here in this table. Temperatures are given in kelvins, which has the same incremental span as degrees Celsius (an increase or decrease of 1 kelvin is the same amount of temperature change as 1o Celsius), only offset so that 0 K is absolute zero. This way, we don't have to deal with a lot of negative figures. Rings of superconducting material have been experimentally proven to sustain continuous current for years with no applied voltage. So far as anyone knows, there is no theoretical time limit to how long an unaided current could be sustained in a superconducting circuit. If you're thinking this appears to be a form of perpetual motion, you're correct! Contrary to popular belief, there is no law of physics prohibiting perpetual motion; rather, the prohibition stands against any machine or system generating more energy than it consumes (what would be referred to as an over-unity device). At best, all a perpetual motion machine (like the superconducting ring) would be good for is to store energy, not generate it freely! Superconductors also offer some strange possibilities having nothing to do with Ohm's Law. One such possibility is the construction of a device called a Josephson Junction, which acts as a relay of sorts, controlling one current with another current (with no moving parts, of course). The small size and fast switching time of Josephson Junctions may lead to new computer circuit designs: an alternative to using semiconductor transistors. 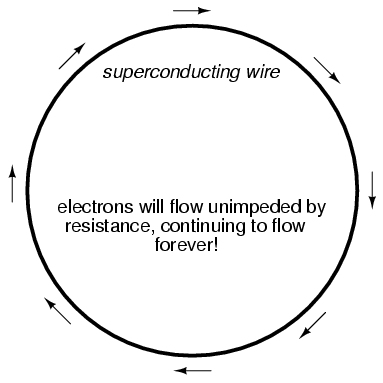 Superconductors are materials which have absolutely zero electrical resistance. All presently known superconductive materials need to be cooled far below ambient temperature to superconduct. The maximum temperature at which they do so is called the transition temperature.